What can we do? Protest. Write a Letter to the Editor. Tell people about the charity, medical, and social model of disability. Blog. Kara and I, along with the Disability Activist Collective (website coming soon) are organizing a campaign against the telethon and the charity model of disability. We need bloggers (not only disability bloggers but all! feminist, queer, woc, environmentalist, activists, great time to build alliances) who will agree to write about this! The campaign will work much like a blog carnival and will be heavily publicized in listservs and other sources of media. We encourage you to participate! To participate, please [leave] a comment or email us a consciouslycrip@gmail.com We will be announcing the campaign on Thursday via media and will tell them to check the website postings on Monday. The campaign will be posted on Kara’s site. The conference ‘When the Soldiers Return’ will be held in Australia at the University of Queensland, St Lucia Campus, 28-30 November 2007. This conference will bring together scholars investigating the legacy of war, its effects on the broader society and culture, and the central role returned soldiers play in these processes. Sandy McFarlane and Keith Horsley, "Florence Nightingale: A Sufferer of a Post-Deployment Syndrome"
Margaret Goldswain, "The War-Damaged Soldier in Australia after the Great War"
Melanie Oppenheimer, "'Fated to a life of suffering': Graythwaite, the Australian Red Cross, and Returned Soldiers, 1916-1939"
Keith Horsley and Sandy McFarlane, "Post-Deployment Syndromes Following Wars in the Nineteenth and Early Twentieth Centuries"
Kristy Muir, "'There were no ticker tape parades for us': Homecomings of Veterans with Mental Health Problems"
Jim Porteous, "Rehabilitation of Injured or Ill Australian Defence Force Members"
Jen Hawksley, "Histories from the Asylum: 'The Unknown Patient'"
Kerry Neale, "'Without the Faces of Men': The Return of Facially Disfigured Australian Veterans from the Great War"
Marina Larsson, "'The Part We Do Not See': Disabled Australian Soldiers and Family Caregiving after World War I"
Stephen Clarke, "The Long Shadow of War: The New Zealand Experience of 'Burnt-Out Diggers' during the 1920s and 1930s"
Curious to learn more about any of these projects? The program (linked above) includes abstracts for all of them. 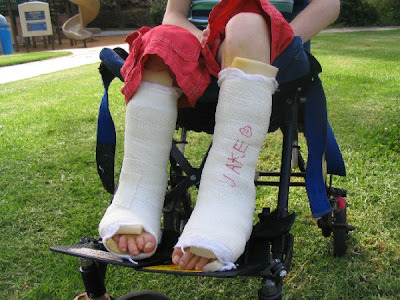 My kid's legs, in casts, taken last week in the park. His sister wrote his name on them. 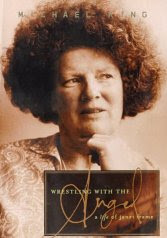 New Zealand poet, novelist, and memoirist Janet Frame was born 28 August 1924, in Dunedin. She spent much of her twenties in mental hospitals, beginning with a voluntary commitment in 1947, ending with her final release in 1954. (A diagnosis of schizophrenia was made, but was later rejected by a panel of psychiatrists in London.) She underwent hundreds of electric shock treatments --"each the equivalent, in degree of fear, to an execution," she said -- during her hospitalizations. Her mother had signed the paperwork for a lobotomy, but the surgery was canceled after Frame's 1951 book, The Lagoon and Other Stories, won a national award. She wrote a novel based on her family and her hospitalizations, Owls Do Cry, published in 1957. Another novel by Frame, Faces in the Water (1961), features a heroine who is institutionalized and almost lobotomized. Her novel Scented Gardens for the Blind (1980) has as its main character a girl who never speaks. Simone Oettli-van Delden, Surfaces of Strangeness: Janet Frame and the Rhetoric of Madness (Victoria University Press 2003). Ana Maria Sanchez Mosquera, "Un/writing the Body: Janet Frame's An Angel at my Table," Commonwealth Novel in English 9-10(Spring-Fall 2000-2001): 218-241. C. MacLellan, "Conformity and Deviance in the Fiction of Janet Frame," Journal of New Zealand Literature 6(1988): 190-201. Susan Schwartz, "Dancing in the Asylum: The Uncanny Truth of the Madwoman in Janet Frame's Autobiographical Fiction," Ariel 27(4)(October 1996): 113-127. Tanya Blowers, "Madness, Philosophy, and Literature: A Reading of Janet Frame's Faces in the Water," Journal of New Zealand Literature 14(1996): 74-89. Venla Oikkonen, "Mad Embodiments: Female Corporeality and Insanity in Janet Frame's Faces in the Water and Sylvia Plath's The Bell Jar," Helsinki English Studies 3(2004): online here. Nineteenth-Century Gender Studies is a peer-reviewed, online journal committed to publishing insightful and innovative scholarship on gender studies and nineteenth-century British literature, art and culture. The journal is a collaborative effort that brings together advanced graduate students and scholars from a variety of universities to create a unique voice in the field. We endorse a broad definition of gender studies and welcome submissions that consider gender and sexuality in conjunction with race, class, place and nationality. NCGS is preparing to launch a special guest-edited issue in Summer 2008 that would read nineteenth-century texts within a disability studies/queer studies/gender studies framework. The issue will engage and answer these and other questions: how do issues of the disabled body and the gendered body parallel each other, or collapse into one another? What are the implications of disability in the construction and practice of femininity in nineteenth-century culture? What are the implications of disability in the construction and practice of masculinity in nineteenth-century culture? How do images and metaphors of physical difference work, with gender, into the forms of nineteenth-century literature and culture? What are the connections between gender, ability/disability, and work in the nineteenth century? What are the theoretical implications of prosthetics in writing/understanding nineteenth-century culture? What are the implications of bodily performance in general in the nineteenth century? Is gender transformation also one of the potentialities we might find in Victorian lit/cultural artifacts on disability? What is the significance, in the investigation of nineteenth-century texts, of queering disability and disability studies? How are both same-gender and heterosexual relationships catalyzed by disability in nineteenth-century plot structures? How are identities of able-bodiedness and heterosexuality connected? How do certain texts in the nineteenth century attempt to transform systems of embodiment? Canadian Paralympian Rick Hansen (pictured at left, on his "Man in Motion" world tour) is turning 50 today--he was born on this date in 1957, in Port Alberni, British Columbia. He was an athletic kid who excelled in several sports. When he was fifteen, he was paralyzed from the waist down in a car accident. So he turned to wheelchair sports, and was more competitive than ever: he became a national champion player in wheelchair volleyball and wheelchair basketball, and a world-class wheelchair marathoner. 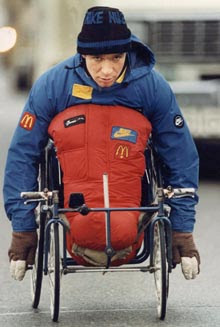 Hansen won a gold medal at the 1980 Summer Paralympics. Hansen's 1985-87 "Man in Motion" tour took him wheeling through more than thirty countries, over 26 months, 40K kilometers, to raise money for spinal cord research and other causes. The wheelchair he used on that tour is now in the museum of the BC Sports Hall of Fame. There are video and audio clips of the news coverage of Hansen's world tour here. Hansen is now president and CEO of the Rick Hansen Foundation, which raises money for research and support programs related to spinal cord injuries. He's married, and the father of three daughters. There are three Canadian public schools named for Hansen, and one township in Ontario--right next to Roosevelt Township, it is (it was named Stalin until 1986, so I'd guess they were going to change it anyway?). Warde's declaration above is from her 1930 lecture, "The Crystal Goblet, or Printing Should be Invisible," and it's saying something that every undergraduate in graphic design is taught: the best font is the one you don't notice. But we soon realized, it was for me--the parent of a regional center client--a questionnaire to complete before a routine meeting next week. Why the childish design? Our regional center's client base is diverse, sure, but every parent they serve is an adult, right? Whether you're a parent with a developmental disability, or a parent with limited literacy or English proficiency, you're still an adult. I understand why the questionnaire should use basic, clear language, but I don't see why this childish font would be used for any adult audience, at least any adult audience you wanted to treat with respect. UPDATE (7/13/11): Four years later, they're still using the same brochure--got another one in the mail just now. Sigh. 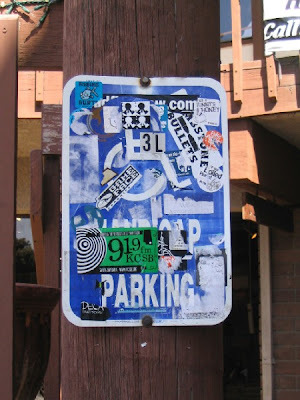 Disability Blog Carnival #21 is up NOW! Next edition is due up on September 13, at Reimer Reason, where the host has set "Resilience" as the topic--take that any direction you see fit, submit your posts or the recent posts of others at the blogcarnival.com site, or in comments here or there, or by email, we'll find them somehow! San Francisco State University's Institute on Disability, the Disability History Association, and the Disability History Group of the United Kingdom invite submissions for papers to be given at a conference at San Francisco State University, 31 July-3 August 2008. During the past two decades, research, teaching, and scholarly publication on the history of disability as a social, cultural, and political phenomenon has drawn increasing attention. The goal of this conference is to assess the state of the field. It will examine the theory and practice of disability history. And it will explore theoretical and substantive, methodological and practical strategies to promote the continued development and intellectual coherence of this field. · The histories of blind people; people with cognitive/developmental disabilities; deaf and hard-of-hearing people; people with physical or emotional disabilities. · Any culture, society, or geographical locale. · Ideologies and the history of ideas. · Institutions, professions, and programs that historically have affected people with disabilities. · Public laws and policies: civil/human rights, eugenic, rehabilitative, international. · Social and political movements. While this call is open-ended as to subject matter, we seek in particular historical case studies that can open up discussion of broader issues. We invite papers that use presenters' current research to consider how they approach the history of disability. What theoretical concepts inform their interpretations? What analytical and methodological tools have they found most useful? How does their work benefit from or contribute to other fields of historical inquiry, such as social history, political history, the histories of class, economic systems, gender, race, religion, sexual orientation, and so forth. If the work focuses on a specific stream of disability history, such as the history of blind people or the history of public policies regarding disabled veterans, what are its connections to and implications for other streams of disability history? How does their work draw upon the more general field of disability studies and what are its implications for disability studies? Commentors will be asked to address these sorts of questions and to facilitate discussion of them in both breakout and plenary sessions. We welcome proposals from scholars of every rank and status from academically based senior faculty to graduate students, as well as public historians, archivists, and other scholars. Proposals for papers should include a title and be no longer than 300 words. Depending on the number of papers accepted, presenters will have 15-20 minutes. A curriculum vitae of no more than three US letter-sized pages must accompany the proposal. Proposals may be submitted electronically via e-mail or fax or sent in hard copy through the postal system. Mailed proposals must include five copies of both the paper proposal and the curriculum vitae. We encourage electronic submissions to expedite decision-making and planning for both the conference organizers and would-be presenters. San Francisco State offers a range of lodging plans that will accommodate both individuals and families. Some of them are economical and affordable for graduate students. If you have questions, please e-mail Professor Longmore at longmore@sfsu.edu. I leant back and rested my elbows on the bench beside him and commented upon his wooden leg in a mild and roundabout way. 'I believe I've seen half a dozen crippled men in coming four blocks through town,' I said, which didn't seem to offend or surprise him. 3. Francis-Xavier Martin in John Bailey's The Lost German Slave Girl (Grove Press 2003) was a real person--because this isn't a novel, but a narrative history of an unusual legal case in antebellum Louisiana. Martin (1762-1846) was an eminent jurist and historian. He presided over the Louisiana Supreme Court for many years, at least a decade of them after becoming blind in his seventies. "Most men would have seen this as a reason for retiring, but not so Martin. When he was no longer capable of writing opinions, he dictated them to an amanuensis; or when none was available, he placed guides at the edge of each page so that he would know when to move his hand down to commence writing a fresh line." (p. 200) If a novelist created a blind judge to hear an appeal about whether or not a slave woman was really white, that would seem too perfect... but sometimes history works like that. 6. Zaren Eboli, also in Nicholas Christopher's A Trip to the Stars (Simon & Schuster 2000), is Auro's mentor and bandmate, a jazz pianist with eight fingers (no pinkies), who's also an expert on spiders (eight fingers, eight legs, see?). A particular kind of spider bite that creates longterm neurological effects (hypersensitive hearing and heightened memory, for example) is part of the novel's complicated plot. There's also a Vegas billiards champion in the book, who has a hydraulic billiards table that adjusts to his wheelchair's height. So this book is full of disability themes. 9. Grace Dietrich in "Two Rivers," a novella in Andrea Barrett's Servants of the Map (WW Norton & Co., 2002) first appears in the story as a deaf child living near the Ohio River in the 1820s, who uses her own gestural language or home sign, familiar to her family. "Grace lost her hearing when she was two," her sister Miriam explains to a visitor, "Most of our signs she invented, though we also use some she's picked up from her friends." (p. 148) With her sister and brother-in-law, Grace helps start an Academy for the Deaf in Ohio; the Dietrich sisters are also part of the brother-in-law's expeditions for fossils, with Grace drawing the detailed maps of their excavation sites. 10. Henry Day in Keith Donohue's The Stolen Child (Anchor Books 2006) is a hobgoblin who has taken over the life of a human boy in mid-20th-century America. Okay, being a hobgoblin is not exactly a disability under the ADA, but the "changeling myth" is an enduring story in disability studies (but see Goodey and Stainton 2001* on whether or not this story has firm historical basis). As a hobgoblin, Henry can imitate human form, but it's a constant effort; and likewise, he has to fake the memories and personality of the boy he's replaced. So there are commonalities with the experience of hidden disability and passing in Henry's story. Two final notes: (1) Inclusion in this list does not constitute an endorsement of the book or the characterization in question--in fact some of them are pretty problematic--but I figure it's still worth knowing they're out there; and (2) The reason these are mostly from 1999-2003 is that I buy a lot of my books secondhand. 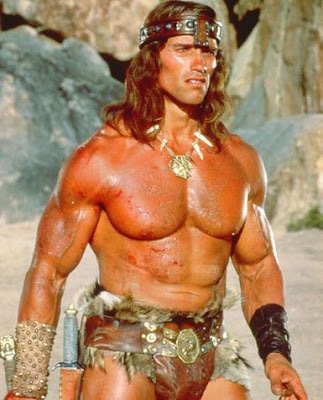 Now, there will be a whole new genre of "Schwarzenegger stories" among the young families of Los Angeles, because the CHIME Elementary School in Woodland Hills, a charter school that's an internationally-recognized model program of inclusive education, is renaming itself after the Governator, as the "CHIME Institute's Arnold Schwarzenegger Elementary School." “I am honored to have a high-quality institution like CHIME Charter Elementary named in my honor. The CHIME Institute shares my commitment to educating all children,” said Governor Schwarzenegger. Wow. And the new school mascot will be... ? The mind boggles. Colorful, long-lived Englishman and civil engineer John Metcalf was born on this date in 1717, in Knaresborough, north of Leeds. When he was six, young John survived smallpox, but lost his sight to the disease. His family, thinking he'd have limited career choices, arranged for him to be taught the fiddle, and he learned to play well. He also knew a lot about horses, cards, and hunting, and was a good swimmer and diver. He married and was the father of four. He was briefly in the army in 1745 (not in combat, but moving guns and assisting a recruiting sergeant). As a young man, he walked to London ahead of his travel companion, and in his twenties he carted fish and other goods from the coast to Leeds and Manchester, or between York and Knaresborough. His business became a stagecoach line, and he drove the coach himself. So he knew the roads very well when, in 1765, he won the contract to build three miles of new road between Minskip and Feamsby. He would, eventually, build about 180 miles of roads, noted for their good drainage and foundations. Metcalf retired in 1792, but in 1794 he walked from Spofforth to York to dictate his life's story to a publisher. He died in 1810, at the age of 92. 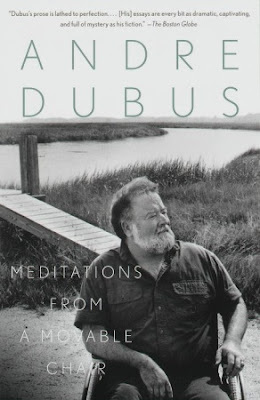 American writer Andre Dubus was born on this date in 1936, in Lake Charles, Louisiana. He was almost fifty years old, an ex-Marine, father of six, a prolific short-story writer and a respected writing instructor when he stopped to help an injured woman and her brother on the road. The three were hit by an oncoming car, killing the brother. Dubus saved the woman by pushing her to safety, but his own legs were crushed by the car instead. One amputation and years of surgery and therapy followed, and for the rest of his life Dubus used a wheelchair. What are all those people doing there? Shouldn't they be wearing gloves, or even masks? Where are the infernal beeping monitors? In the early 20th century, incubators for premature babies were considered a fascinating technological novelty--but hospitals needed funds to purchase them, and that required public support for the idea. To raise interest, incubators were displayed to the public, with the babies still inside, many of them under 3 lbs at birth. "Baby hatcheries" were found at state fairs, and amusement parks like Coney Island. Admission was charged (10 cents), ostensibly to pay for the costs of maintaining the display, and for the lesson imparted by the "experts" on site, who answered questions about the babies and the technology. Some visitors returned again and again to follow the progress of particular babies; twins were especially popular. When babies reached a healthy weight, they were returned to their parents (who were not generally involved in the baby's daily care during incubation). Hannah Lieberman, "Incubator Baby Shows: A Medical and Social Frontier," The History Teacher 35(1)(November 2001): 81-88. NOTE: Lieberman was a high school student in Minneapolis when she wrote this essay, which won the National History Day 2001 Competition for Senior Division Historical Paper. A. J. Liebling, "A Patron of the Preemies," New Yorker (June 3, 1939): 20-24. Disability Blog Carnival #20 is up NOW! 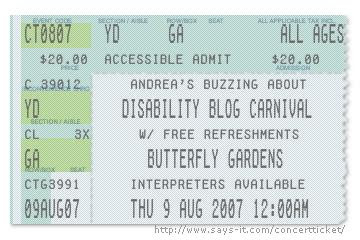 Take your beautiful ticket (at left) and head on over to the latest edition of the Disability Blog Carnival, now up at Andrea's Buzzing About. "On Holiday" is the theme, and Andrea's conjured a gorgeous late summer festival, complete with a bandstand, gluten-free brownies, and butterfly gardens. Drown the frustrations of a gravel path and a cruise gone bad, while you celebrate the accessible sailing and improved airline service out there. Jazz instrumentalist Rahsaan Roland Kirk (pictured at left, in sepia-toned profile) was born on this date in 1936, in Columbus, Ohio. He played all sorts of woodwind and reed instruments: saxophones, clarinets, flutes, harmonicas, English horn, among others. Oh, and sometimes he played more than one saxophone or flute at a time--and it didn't sound like rush hour traffic (unless he wanted it to, I guess). Kirk was blind from infancy. He attended the Ohio State School for the Blind, where he played in the school band. He was playing professionally while still in his teens, and recorded his first album before he was old enough to vote, in 1956. In 1975, Kirk had a stroke with lasting hemiplegia--so he modified some of his instruments to be played with just one hand. In the winter of 1977, Kirk had a second stroke, which was fatal. He was just 41 years old. Check out Kirk in performance on YouTube, here, here, here, and here, for starters. How did Mark Twain, Herman Melville, Lydia Sigourney, and James Fenimore Cooper employ deafness themes and deaf characters? Check out Christopher Krentz's new book, Writing Deafness: The Hearing Line in Nineteenth-Century American Literature (UNC Press 2007; cover shown at right). Krentz is an assistant professor of English at the University of Virginia, and also editor of A Mighty Change: An Anthology of Deaf American Writing, 1816-1864 (Gallaudet University Press 2000). A comment here at DS,TU alerts us that Pedro Guzman has turned up alive in a jail in the Antelope Valley--I'm still looking for some news coverage of this development, but if it's true, it's great news. And I hope the whole strange story can be explained now, somehow. But while I was looking for that, I noticed that the LA Times had a story yesterday about the disability community and AB 374, the assisted suicide bill recently defeated in California. It features quotes from Paul Longmore, Marilyn Golden of DREDF, Ann Guerra, and Laura Remson Mitchell (against the bill) and Alan Toy and Lloyd Levine (supporting the bill). It's a good piece; thanks to the writer, James Ricci, and all involved for presenting the issues clearly and respectfully. UPDATE (7 August): Our commenter had the scoop--Pedro Guzman has apparently turned up alive--but it took till late this morning to find confirmation at the LA Times (thanks to Stephen Drake for the tip). Seems Guzman was found trying to return to the US (he is an American citizen) at Calexico. The ACLU is starting a press conference about Guzman's reappearance in a few minutes (1pm California time). UPDATE (8 August): NBC 7 in San Diego has a new photo of Pedro Guzman after his return to California: "His family said he ate out of garbage cans, bathed in rivers, and was repeatedly turned away by US border agents when he tried to return to California." So, US authorities were seeing him repeatedly during this time--and nobody suspected that he was the Pedro Guzman that was urgently sought? He was an American citizen, lost, confused, and in trouble in Mexico for almost three months. Lady Bird Johnson (1912-2007) took on "highway beautification" as a project while she was First Lady in the Sixties. Pretty safe choice for a fifty-something Southern lady, in a socially tumultuous decade. Except... her beautification agenda eventually paid off for a civil rights movement anyway. By working for more park land and recreational spaces close to urban areas, Johnson paved the way (almost literally) for wheelchair-accessible recreation areas, too. Town Lake in Austin, Texas, was one example of this phenomenon. Formerly a "garbage-strewn eyesore," in the words of one former mayor, the Lake (really a reservoir) has since become a "jewel" in the state capital. Hundreds of trees were planted, trails were laid out, and it's now a favorite spot for many Austin residents. After leaving the White House, the Johnsons were Austin residents themselves; and after her stroke in 2001, Lady Bird used a wheelchair. Her daughter Luci said that they loved to go around the lake trail in her last years. "We discovered it was wheelchair accessible--although not quite enough," said Luci. Now that the lake has been renamed Lady Bird Lake, Luci hopes that the city will honor the spirit of its namesake, improving and increasing the accessible trail's reach. (As Katja recently observed, some people really do want recreational wheelchair access that goes more than a few hundred feet.) If you're in Austin sometime, go see if they've met that goal. Prefer to stay on the West Coast? The Lady Bird Johnson Grove in Redwood National Park also boasts a one-mile wheelchair-accessible trail.